Kindergarten, 1st grade & 2nd grade teacher~19 years, wife, mom to 2 amazing kids, animal lover, positive thinker & lucky friend. Likes: Sunshine, running with friends, vinyasa yoga, Barefoot Beach, every moment I get to spend with my family, slobbery dogs, Rose wine with ice & fruit & laughing until my sides hurt. Dislikes: Being cold, scary or gory anything, cottage cheese, feeling rushed. Kristin earned both her Bachelors & Graduate degrees from John Carroll University in University Heights, Ohio. Her undergraduate degree is in Early Childhood Education (K-8) and her graduate degree is in Academic Supervision and Administration. 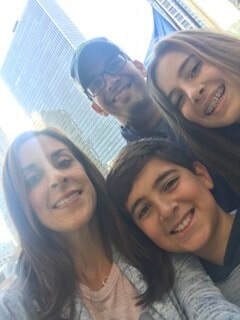 Kristin worked as an early elementary classroom teacher for 19 years: teaching second grade, then first grade & her final move through the state landed her teaching Kindergarten in beautiful Bay Village, Ohio where she taught for 13 years, and currently lives. Kristin feels incredibly lucky to have been part of the lives of such incredible students & their families. She keeps in contact with many of her former students, and many of their parents have become her dearest friends. After leaving the classroom in June of 2016, Kristin was grateful to pass along her teacher materials to a former 1st grade student who had just secured her first job as a kindergarten teacher! It was an incredibly special experience. Her most recent adventure was the completion of her 200 Hour Yoga Teacher Training, which was an enormous personal accomplishment for her, and her family was amazing & supportive while she worked through the 6 months of training. Kristin loves to travel with her family. She loves adventures, both loud and quiet, big and small. She adores her husband, Mike, and her kids, who are the greatest gifts she ever received. Kristin loves her crazy dog, Scout, who she refers to as her “furry boyfriend”, and her very crabby cat, Dillon. Kristin loves meeting new people, and she is passionate about living with intention, being present, traveling & exploring this incredible world. She loves BIG, and she is looking forward to pouring that love into Cleveland’s Angels. Namaste!